Wyboston Lakes is a large leisure and business complex, just a short taxi ride from St Neots station, set in 350 acres of countryside. Their new addition to the main hotel and restaurant building, Y Spa, has a fabulous indoor/outdoor wet and thermal spa with a whole host of traditional and ultra-modern facilities to try out, plenty of stylish and comfortable relaxation spaces, and a great range of Murad and Elemis treatments on offer. "Some like it hot!" is the title given to this outdoor heat room, the hottest of Y Spa's facilities at 85 degrees. The kelo sauna is a Finnish-style cabin, made from 100 year old logs, in keeping with tradition. This spacious heat room has a glass front, so you can warm yourself while keeping an eye on your friends in the spa garden and pool. The spa garden is an area for fun and relaxation. There's a fire built into the wall, and a comfy sofa in front, so you can relax in front of the flickering flames, or get out in the sunshine on warmer days. Indoors, the spa facilities continue. "Softy" is a sauna heated to a moderate temperature, which also has a glass front overlooking the pool. "Steamy" is the steam room (which was as nice and steamy as the name suggests!) Within the thermal zone you'll also find the fun experience showers, with a mixture of gentle mist and "glacier" cool. At the back, there's a frost wall. If you're brave you can scoop off ice to rub on your skin after the heat of the sauna and steam room. We opted for the Murad Intensive Wrinkle Reducer (IWR) and rapid peel (70 minutes, £70). Our therapists used the Murad skin scanner to capture an image of our skin, and then the printed Murad Facial Assessment report was used to help diagnose the main areas of concern, including any wrinkles and dehydration, redness or pigmentation. Rachel, one of the highly competent Murad therapists, told me that the IWR products contain durian fruit (an Asian fruit full of vitamins and minerals) and glycolic acid (an AHA used to improve skin texture). Bring it on! Rachel used a steam machine to open up the pores, then cleansed and toned my face. Rachel applied the IWR mask to my face, neck and décolleté, asking me to rate my comfort level between 1 – 10. There was tingling, but it was certainly not unpleasant. Rachel left the mask to work for 10 minutes, and gave me a dreamy head massage. To finish, Rachel applied a cooling toner and "hydro-dynamic" moisturiser. Afterwards, my skin really did look brighter and more hydrated, and my fine lines, although not entirely gone, were definitely reduced. Be aware that if you opt for this treatment your skin will be left sensitive, so you can't use the thermal facilities afterwards . We also tried an Elemis Deep Tissue Massage (50 minutes, £75) with therapist Christine. Christine placed a few hot stones under my shoulders which felt surprisingly soothing and instantly relaxing. She placed a few other hot stones strategically across my body to aid the relaxation process. Christine customised the massage to my needs and used the Stress-Away blended oil. She employed long, rhythmical strokes across my body, and limb by limb. I was lulled into a calm, deep sense of relaxation. My tight muscles were eased, my cares had slipped away, and I glided out of the room feeling rested and much less achy. Delightful. Relaxation is taken very seriously at Y Spa, with three separate areas designed to make sure you get the chill-out time you really want. The Big Sleep, as the name suggests, is a space for some shut-eye. A row of water beds covered with luxurious blankets and cushions runs along one wall; the beds gently mould round your body as you sink into them, making it pretty hard to stay awake! The separate Time Out area and pre-treatment lounge means you won't be disturbed, either. 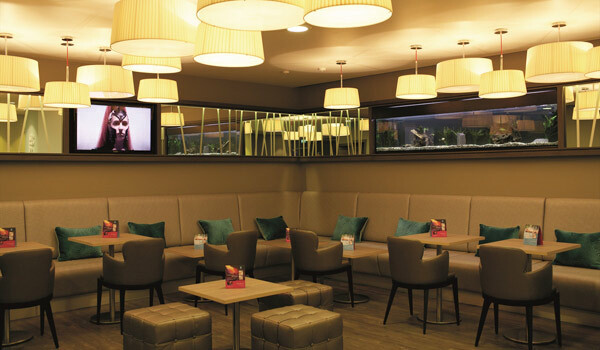 Time Out is another relaxation area next door to The Big Sleep. Here you'll find things such as iPads and glossy magazines to keep you entertained if you're feeling a little too alert for a snooze. The pod-like seats allow for guests to swivel themselves round to be sociable with their spa partners, or to snuggle inside for a bit more privacy from your neighbours. Y Spa has its own café for refreshments and afternoon tea. Fish tanks built into the walls give you something calming to gaze at as you sip on your smoothie (or quaff your Champagne and cake!) If you're at Y Spa on a full spa day or spa break, then main meals are served in the hotel's Waterfront Restaurant, but robes are allowed, so you won't have to change just for lunch. We had a fresh, healthy salad for lunch, but our good intentions soon went awry when we saw the afternoon tea menu. We couldn't resist a bit of indulgence, and the cute little sandwiches and cakes were just the ticket! In the evening we dined from the main restaurant menu, opting for a nicely cooked steak from the grill menu, and a tasty salmon and pea risotto. 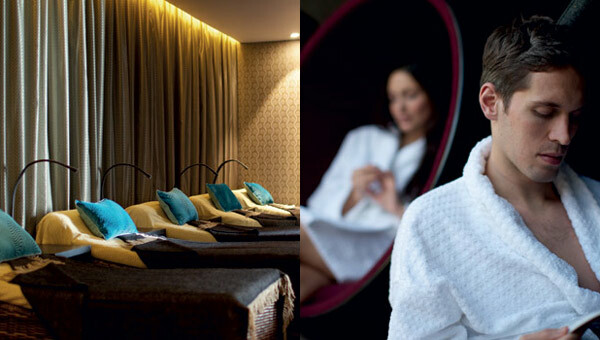 For more information on spa days and spa stays at Y Spa, see their page on our website.